Believe it or not, I’ve missed my blog. I’ve missed interacting with my readers and talking about all the cool science occurring in meteoritics and planetary science. A few factors have contributed to my absence from blogging: school/work load, my work in the meteorite lab, and a general burn-out over the course of the academic year. I essentially worked myself into the ground during the Fall and Winter term and the Spring term has been my recovery period. That and it’s difficult to get back into blogging when you’ve been away from it for a period of time. I’m hoping to change that though with more regular posts. So, as a way of easing back into the blog I thought I’d start with a new Meteorite Monday Tuesday! This time I’m going to talk a bit about a project that has consumed a great deal of my time: the shock dike in my meteorite. And since this is all available in the poster I did for LPSC, I don’t have to worry about revealing information intended for the publication. What you’re looking at is a transmitted light image of the meteorite I’ve been working on. That thick, black structure from the lower right corner to the top left corner is what we’re referring to as a shock dike. This isn’t something that’s been studied before, so our term isn’t one that’s been utilized in the past. In fact, I ran into some resistance to the term at LPSC because the term dike is traditionally used in a terrestrial setting and not that of an extraterrestrial. What some people forget is that we apply earth based geophysical and geochemical analogs to other bodies in the solar system all the time. It’s that application that allows us to understand the forces that shape the other rocky planets. 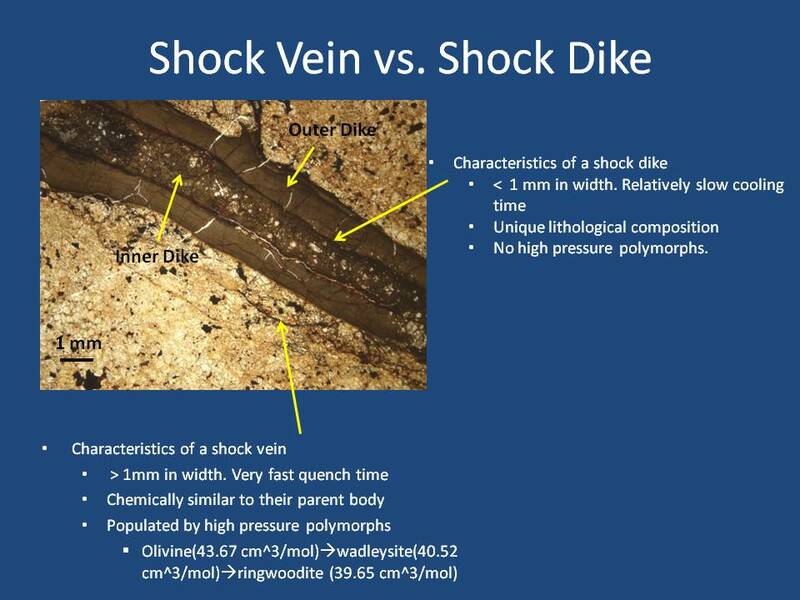 Here’s what we know about the formation of shock veins, and by extension, this shock dike. We know they form as a result of a collision in space. The kinetic energy from that collision would become the heat needed to melt a large portion of the rock. That melted rock acts a lot like water- it flows through cracks and exploits areas of weakness within the solid rock structure. That sudden influx of melted rock also drives up the pressure and changes the minerals it encounters into high pressure polymorphs- or minerals with the same chemical composition, but a more compressed crystal lattice structure. Such minerals become encased in the rapidly cooled vein and don’t have the chance to change back to their preferred structure. What makes the shock dike unique is that it didn’t cool quickly and there are no high-pressure polymorphs. Everything pretty much melted. The heat needed to melt the rock was produced by an impact and sustained through friction as the rock sheared like a strike-slip fault. 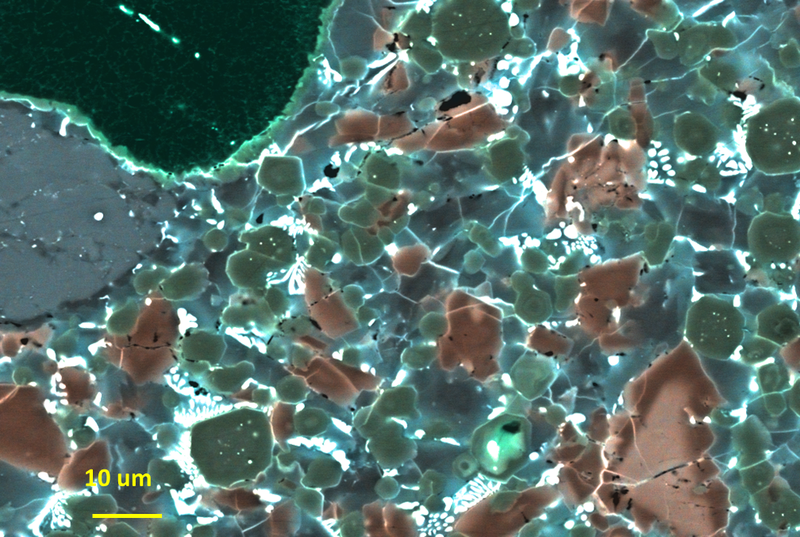 This sustained heat and mechanical grinding vaporized the less heat tolerant feldspars, and melted pieces of the more heat resistant pyroxenes and olivines. As these minerals broke down they added their chemical components to the melt. This, combined with a relatively long cooling time, caused new minerals to form out of this melt. Such minerals include pyroxenes composed of alternating bands or iron and magnesium and aluminum rich pyroxenes; all indicative of crystals that grew from a melt. 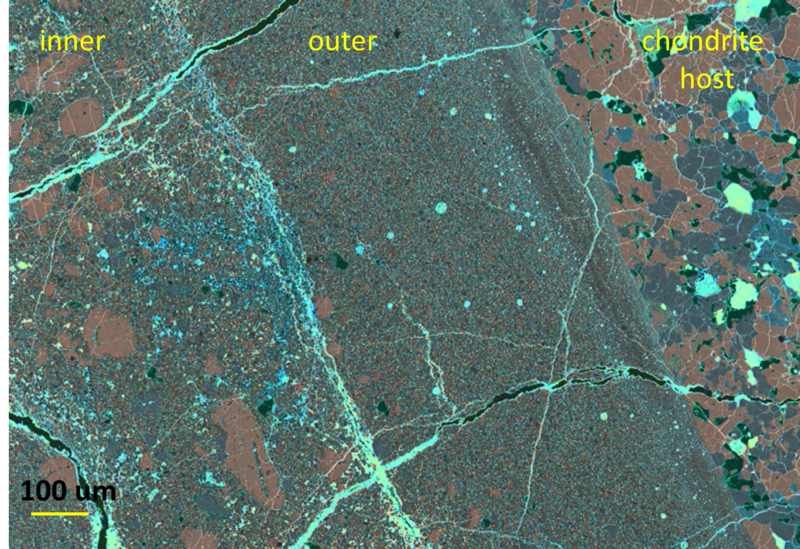 This is a false colored back scatter electron image of the shock dike. The salmon colored minerals in the inner dike are olivines and they correspond to the same minerals found in the chondrite host. The false color allows us to determine the chemistry of the minerals we’re looking at. Now that we’ve got a handle on a the chemistry of our system and how it possibly formed, our next task is to deduce how long it took to cool. We know that it sustained its heat for a time sufficient enough to generate brand new crystals. What we don’t know is how long it took to cool. Something we’re looking at is the high aluminum content in our pyroxenes. The amount we’re dealing with tells us that we had some disequilibrium conditions occurring right as our melted rock solidified. This will be important for telling us the maximum temperature of our melt and the temperature at which it cooled. This is the same false color BSE image, but at a higher magnification. The bright green minerals are our aluminous pyroxenes. The large greyish blue clast in the upper left is a pyroxene clast and the one mineral right above it is a feldspar. The large triangular mineral in the lower left corner is an olivine clast. The bright pink core is unmelted iron rich olivine and the dark pink rims are melted and recrystallized magnesium rich rims. This summer I’ll be working to address these issues through the McNair program. This is a research scholarship that will essentially pay me to do full time research this summer and present it at the McNair Symposium. If I’m so inclined (and I am) I can also submit it to the McNair Undergraduate Journal for publication. Then in the Fall I’ll be working with both my advisers on a journal publication about my meteorite. I’m also looking to do a poster for the AGU conference in December. If I’m feeling particularly courageous, maybe an oral presentation, too.